Share of Voice is an excellent way to evaluate your SEO efforts, as it combines monthly searches with your rankings, to give an accurate representation of how you are performing in the organic search market. What is Share of Voice and how is it calculated? Share of Voice (SoV) is an indicator of how your most important keywords are performing. All keywords that rank between positions 1 to 20 are used for the calculation. The average CTR for the position is multiplied by the search volume of each keyword, allowing you to see if high traffic keywords are losing or gaining ranks. When using Share of Voice, it is important to keep in mind that brand specific keywords might skewer the results. Keywords such as your brand name have a tendency to rank as number one. In most cases, your competitors are not optimizing to rank for other brand names. Furthermore, the CTR rates for brand searches are very different. Share of Voice shows graphs for your mobile and desktop keywords, with their current data showing on the right hand side. Should you only want to see data from i.e mobile keywords, you can click on the small dots above the graph to filter for devices. To the right of the graph, you can click on your competitors' domains to see how their SoV compares to yours. In the top right corner, you can select which date intervals you want to see data for. To compare exact numbers, hover your mouse over any date as illustrated in the screenshot above. Customers with subscriptions including 1000 keywords and up have the added benefit of more in-depth Share of Voice data, that extends the overview and keywords list. Share of Voice Competitors - Shows both your and your competitors' Share of Voice as well as the untracked SoV. Share of Voice Tags - Displays SoV data for all your tags, assuming you use our tagging feature. Share of Voice Landing Pages - Shows Share of Voice figures for the combined total of keywords pointing to your Landing Pages. 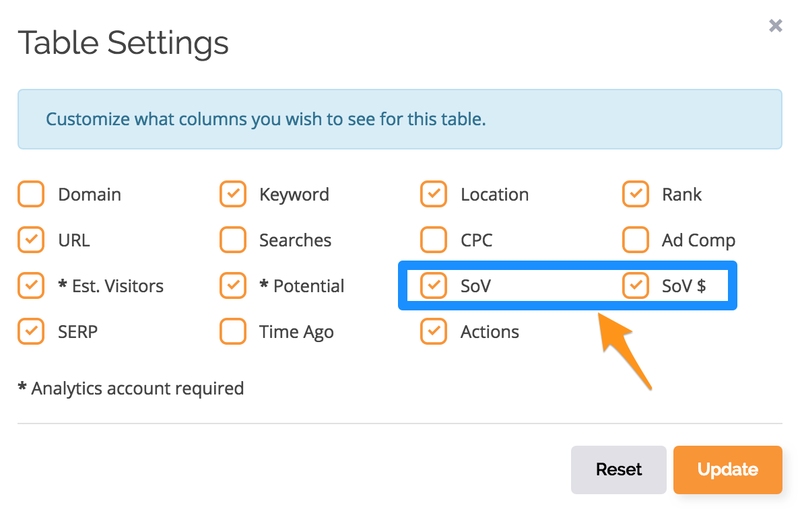 Additionally, you now have the option to add SoV data for individual keywords. SoV is short for Share of Voice. Enabling this will show you the Share of Voice for individual keywords, in the keywords table. SoV $ is the average CPC times your SoV. To add these tables to your keywords list, go to "table settings" and enable them. AccuRanker offers many other metrics to monitor the value of your SEO effort, click here to read more about Average Ranking.